(Reuters) - Canada's main stock index pulled back from six-month highs on Friday after the country's overall inflation missed the central bank's target for the second straight month, while energy stocks came under pressure from a drop in oil prices. * At 9:37 a.m. 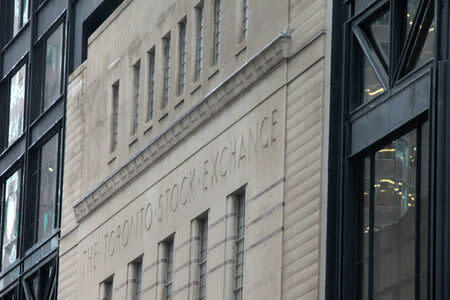 ET (13:37 GMT), the Toronto Stock Exchange's S&P/TSX composite index was down 73.03 points, or 0.45 percent, at 16,171.56, on pace for its steepest drop in two months. * Domestic economic data showed Canada's annual inflation rate edged up to 1.5 percent in February, but remained below the Bank of Canada's 2.0 percent target for the second successive month. * Stocks retreated worldwide after soft German manufacturing data stoked fears of a global economic slowdown, following a dovish turn by the Federal Reserve earlier this week. * Meanwhile, Canadian retail sales unexpectedly dropped for the third consecutive month in January, mainly due to weak auto sales. * U.S. crude prices slipped 1.2 percent a barrel, while Brent crude lost 1.4 percent. * The heavyweight financials sector slipped 0.6 percent, while the industrials sector fell 0.6 percent. * The materials sector, which includes precious and base metals miners and fertilizer companies, lost 0.3 percent. * On the TSX, 86 issues were higher, while 154 issues declined for a 1.79-to-1 ratio to the downside, with 14.86 million shares traded. * The largest percentage gainers on the TSX were BRP Inc, which jumped 5.7 percent after posting fourth-quarter results, and Fortuna Silver Mines Inc, which rose 1.8 percent. * MEG Energy Corp fell 3.1 percent, the most on the TSX. The second biggest decliner was Baytex Energy Co, down 2.8 percent. * The most heavily traded shares by volume were Aurora Cannabis, Bombardier Inc and Encana Corp.
* The TSX posted six new 52-week highs and no new low. * Across all Canadian issues there were 48 new 52-week highs and two new lows, with total volume of 24.84 million shares.